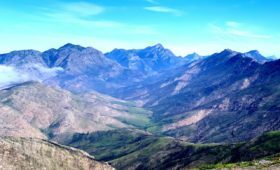 “Increasingly authorities and landowners alike are recognising the urgent need to reduce the presence of invasive alien plants on the landscape, the threat it presents and the benefit of an environment consisting of indigenous vegetation only,” says Cobus Meiring of the Southern Cape Landowners Initiative (SCLI). 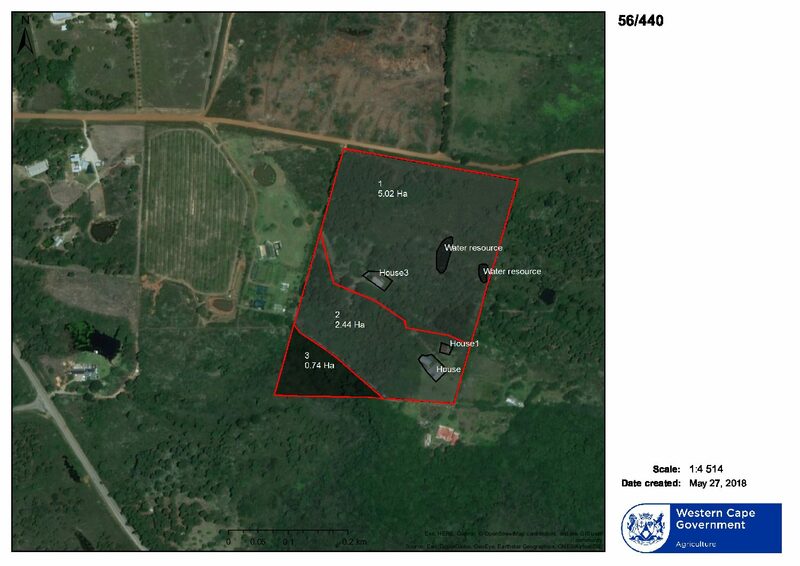 “The Duiwenhoks Conservancy, under the leadership of Dr John Thorne, is spearheading a new drive to safeguard approximately 3 000 hectare burn scar from invasive alien plant regrowth in the Vermaaklikheid area on the Garden Route. 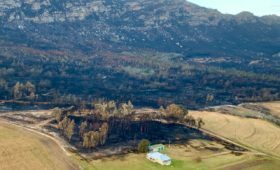 Wildfires raged through the area in October 2018 and destroyed invaluable historical properties along the Duiwenhoks River,” says Meiring. Vermaaklikheid is a village on South Africa’s Garden Route. It is situated near Witsand and close to the Duiwenhoks River. 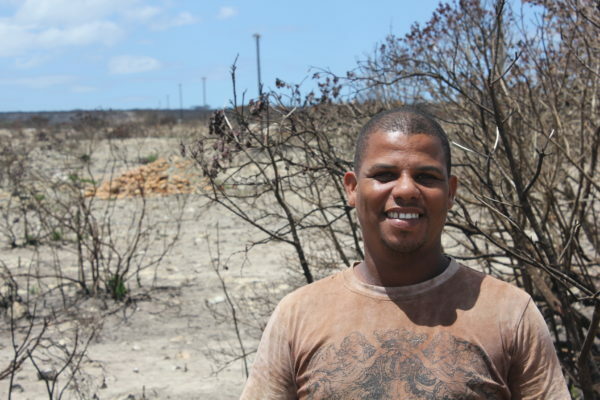 Vermaaklikheid landowners affected by the fire have new hope to save their land from another generation of invasive alien plant infestation by preventing the area from being overrun by predominantly Rooikrans. “The fires are providing landowners with a clean slate to save their land,” says Meiring. 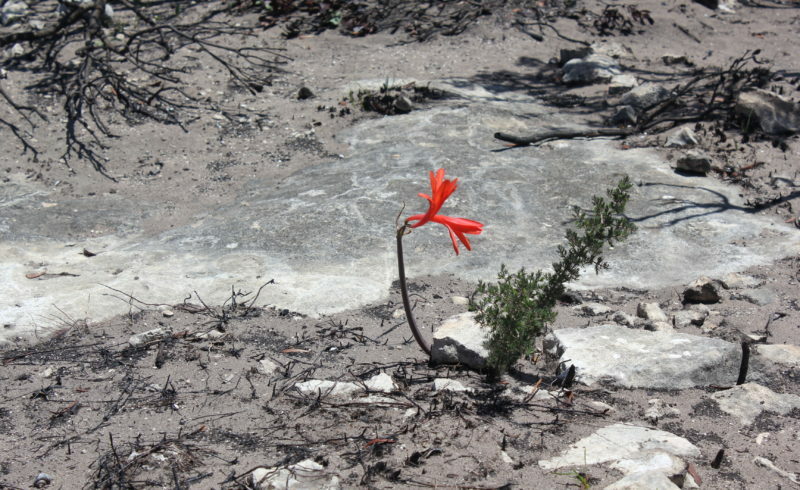 With input from the Department of Environmental Affairs (DEA): Natural Resource Management (NRM), the Southern Cape Fire Protection Association (SCFPA) and the Garden Route Environmental Forum (GREF), the Duiwenhoks Conservancy under the leadership of Dr John Thorne is spearheading the drive to safeguard the approximately 3 000 hectare burn scar from invasive alien plant regrowth. The strategy the Conservancy wishes to adopt is to encourage landowners to develop invasive alien control plans for their properties, and to collectively deal with the problem. 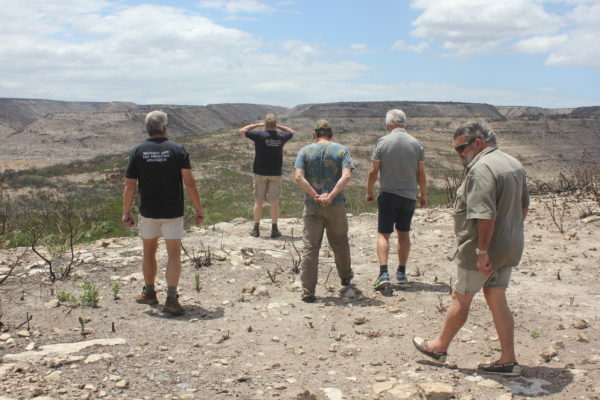 Heading up a small team of conservancy team members, project manager Abe Pretorius is confident that even the small team can make a huge difference in managing invasive alien plant regrowth by hand-pulling Rooikrans plants as they emerge from the soil. 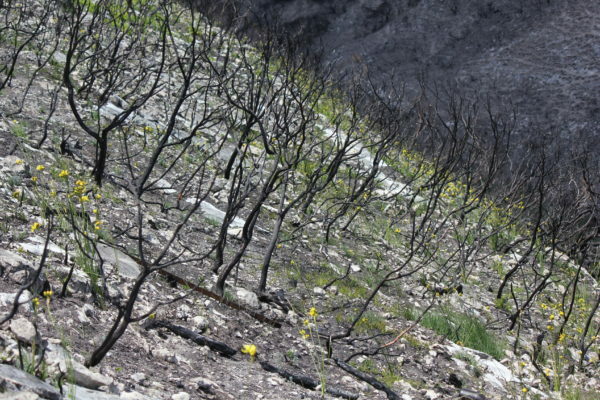 “In what is becoming the norm in a region staggering from the one fire disaster to the next, invasive alien plants almost always contribute to the severity and intensity of wildfires in the Western and Eastern Cape,” warns Meiring. Increasingly frequent out of control wildfires, driven by strong wind and fuelled by unnatural densities of invasive alien plants and dry biomass, are often defined as a direct result of a fast-changing climate. 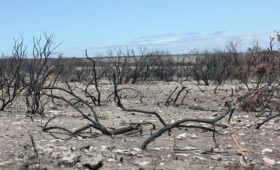 Approximately 3 000 hectares of land was completely destroyed by the fire, leaving behind a lunar landscape exposed to large-scale wind erosion and the already-present threat of large-scale invasive alien plant regrowth. Indigenous regrowth – Bobartia sp.